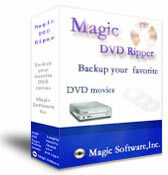 Magic DVD Ripper is a powerful and easy-to-use DVD backup software, which can backup original DVD to hard disk or convert DVD to VCD, SVCD and AVI(DivX) formats. You can then burn the output files to DVD-R/RW or CD-R/RW by burner software. With optimized for Intel CPU. Magic DVD Ripper provides fast ripping speed and wonderful output quality. It supports batch file processing and has many settings that you can customize. And it can detect DVD disc and select appropriate settings automatically for beginner, so you can get started with just one click and option to auto shutdown your computer when completed.